A motion tabled at the NSW Labor Party annual conference on Sunday could be the key to the introduction of a Papua New Guinean team entering the NRL in the future. The motion, proposed by Inner West Council Mayor Darcy Byrne and seconded by Member for Kingsford Smith, Matt Thistlethwaite, calls for a future Federal Labor Government to support PNG’s NRL bid as a foreign policy initiative. PNG is the only country in the world that can claim rugby league as its national sport and recent results have proven the nation has considerable talent in its ranks. The Kumuls, fresh from their quarter-final appearance in last year’s World Cup, upset Fiji in last weekend’s Pacific Test. The PNG Hunters are also the defending champions in Queensland’s Intrust Super Premiership competition after beating the Sunshine Coast Falcon’s in last year’s grand final. biggest obstacle in the way of NRL inclusion would be raising the funds required to bankroll the project. However, Sunday’s proposal could see an elected Labor Government support a PNG NRL bid to build economic, cultural and social ties between the nations. "Papua New Guinea is our closest neighbour and the only nation on earth to have rugby league as their national sport. In fact, rugby league is like a religion for New Guineans," Byrne said. "Establishing a PNG team in the NRL would transform the relationship between our two nations and create permanent cultural and social connections between our peoples. PNG is the only country in the world to count rugby league as its national sport. "PNG is a former Australian colony, with almost double the population of New Zealand, but sadly we haven't developed the same familial relationship with New Guineans that we have with our cousins across the ditch. Byrne has liaised with the NRL about the motion, while ARLC chairman Peter Beattie is on record as saying the game “must expand or die”. The Prime Minister's XIII team training in Port Moresby ahead of their annual clash with PNG. The motion also calls for initiatives to continue to strengthen the financial sustainability of the PNGRL, as well as a continuation of programs that address social challenges such as domestic violence. The people of Bougainville now have access to improved health services with the official opening of the upgraded Arawa Hospital. 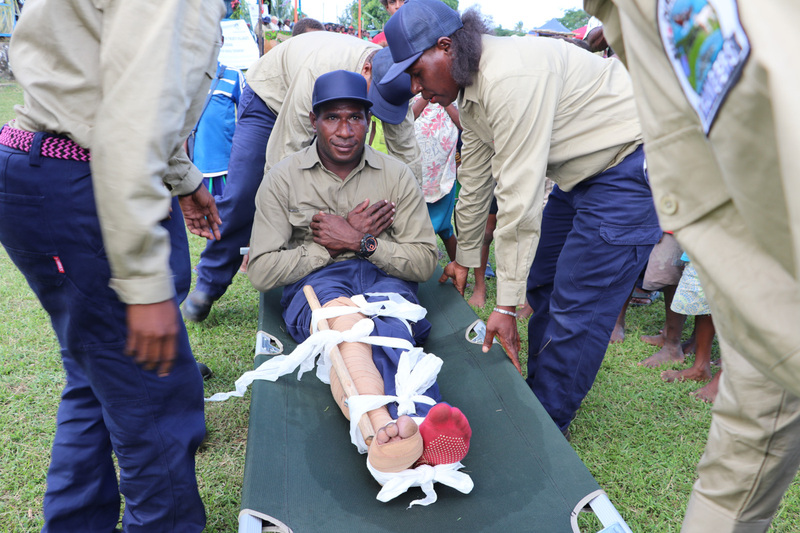 Senior medical officer Dr Joe Velosi and nurse Felicity Osioco attending to a patient at the upgraded Arawa Hospital. 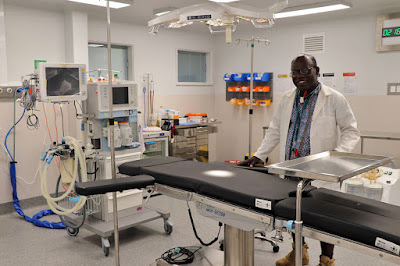 From 2015 to 2018, the Australian Government provided K33.8 million for the upgrade of the then Arawa Health Centre to a district hospital. 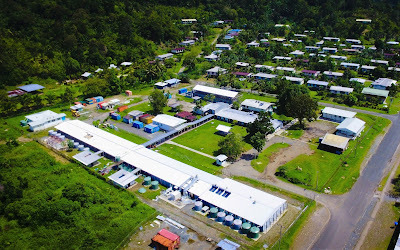 Bird's eye view of the upgraded Arawa Hospital. Under the partnership arrangement, the Autonomous Bougainville Government purchased equipment for the hospital at a value of PGK4 million. Senior medical officer Dr Joe Velosi with new equipment at the upgraded Arawa Hospital. 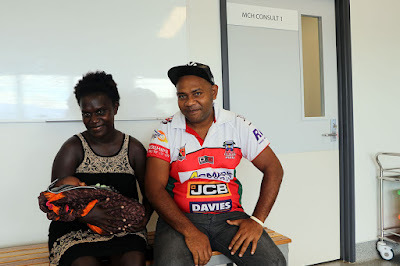 The hospital was opened on today by Prime Minister of Peter O’Neill, President of the Autonomous Region of Bougainville John Momis, and Australian High Commissioner to Papua New Guinea, Bruce Davis. Community health worker Jean Kevan holds two-month old Cornellius in the Maternal and Child Health waiting room. “Australia is proud to deliver these new and expanded health facilities in partnership with the Government of Papua New Guinea and the Autonomous Bougainville Government,” said Davis. The hospital upgrade includes a range of improved facilities, including a labour ward, surgical facilities, general medical wing and multipurpose wing with 24 new ward beds, nurse stations, pharmacy dispensary and biomedical laboratory. A key part of the project was the provision of an on-site Family Support Centre for survivors of family and sexual violence to access specialised health care. The centre includes counselling and consultation rooms, safe rooms, transit accommodation, and disability access. Since the hospital opened to the public in early 2017, the delivery of health services to Bougainville people has doubled its daily operational attendance, admissions, antenatal care and deliveries. 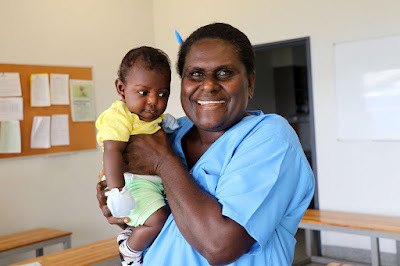 Women from remote communities around Arawa who previously have not had access to maternal care have been able to come to the facility to deliver their babies safely. The project generated around 500,000 hours of construction-related employment to the local economy and strengthened local trade skills. It was delivered through the Papua New Guinea – Australia Partnership with the Autonomous Bougainville Government’s Department of Health. The annual Miss Pacific Islands Pageant (MPIP) PNG Project Runway sponsored by the Pacific Balanced Fund will be staged at The Stanley Hotel and Suites in Port Moresby on July 28 this year. This outfit created by WANTOK Clothing was the winner of the Traditionally Inspired Dress category in last year’s Project Runway. The model – Sheilla Yama – is wearing this piece which was inspired by Milne Bay Province and the skills of the Milne Bay people in terms of weaving and carving. It incorporates themes, patterns and colours of the Milne Bay Canoe culture and is made from pandanus, copra sack, feathers, wood, pearls, pearl shell and abalone shell, all sourced locally. Wantok Clothing was assisted by skilled ladies and men from Divinai village in Milne Bay Province. This is the fourth year for the Project Runway to be staged and my…has it come a long way! Thanks to Facebook – this event has gained popularity through the Miss Pacific Islands Pageant PNG FB Page which has over 13,000 followers. The creativity and unique handiwork of our local designers on stage have been photographed and shared by fans and critiques many times over, on social media. This has assisted with ticket sales for the event which provides a platform for local designers to showcase their talent. Not only that, the main reason behind the Project Runway and the Miss Pacific Islands Pageant (MPIP) PNG is a noble cause that has resonated well with supporters. 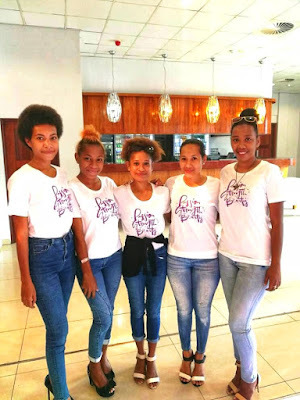 Funds raised through these events go to a Scholarship Fund which assists young women to complete their education in colleges and universities in PNG every year. This is an invaluable tool for empowerment of women that has been in place since 2011. Under the patronage of Ms Lynda Babao-O’Neill and Chair of Mrs Molly O’Rourke, supported by a hard-working committee of volunteers, the MPIP PNG has grown from strength to strength as the stats below indicate. In 2017 the Scholarship Fund assisted 42 young women with a budget of K84,973.00. This year the fund is assisting 54 young women with a budget of K160,308.00. For the first time this year, the annual Ruby Anne Laufa Award was awarded to a young woman - Samantha Mosoro - who is completing her studies at the Legal Training Institute (LTI). 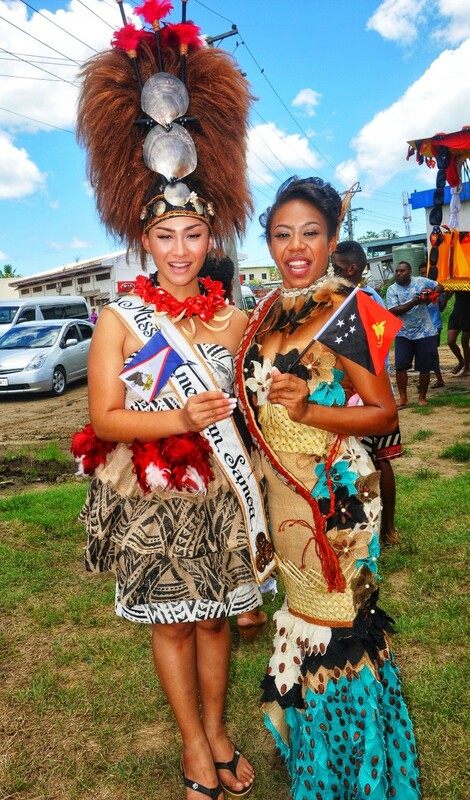 Miss Pacific Islands, Matauaina Gwendolyn Toomalatai of American Samoa and Miss Papua New Guinea Niawali Anastacia Twain at the Albert Park in Nadi, Fiji during the regional pageant last December. 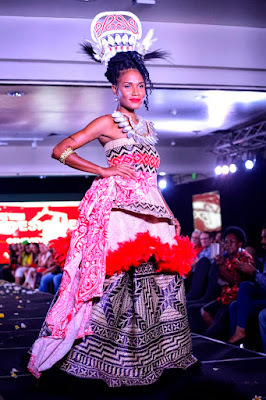 One of the reasons why Traditionally Inspired Dress is an important category in the MPIP PNG Project Runway…it is also an important category at the Regional pageant. This Award is in memory of former Miss South Pacific PNG (2012-2013), Ruby Laufa who passed away in tragic circumstances in February 2017. She was at the LTI when she passed on. The MPIP PNG Scholarship is advertised on the Miss Pacific Islands PNG pageant FB Page at the beginning of each year. The MPIP PNG Committee selects students mostly in third and final year. This year was a challenge because of the increase in fees in many institutions around the country, and in the priority areas of Health, Education and Agriculture. There were over 300 applications which unfortunately could not all be catered for. Whatever funds raised at the Project Runway will be a welcome addition to the Scholarship Fund. This year the Project Runway will be a little different. The evening event will be called “A Night of the Arts”. Along with the main runway attraction, there will be pop-up stalls market, live entertainment and live painting. It will be a celebration of the creative industry to give guests something spectacular to enjoy. There will be 20 stalls in the market which will open for customers at 5pm. A total of 60 models are expected to strut their stuff on the runway beginning at 6.30pm. The Project Runway this year has been opened up as a wider platform for Small and Medium Entreprises - artists and artisans to display their ware and promote sales, in addition to showcasing outfits from 10 local designers; four from Port Moresby and six from out of town. One of the six is a young man residing in Cairns, Australia. The runway extravaganza will feature a good mix of established as well as emerging designers. Outfits will be modelled in the following categories (1) Day /Evening Wear (2). Sarong (3) Traditionally Inspired Dress (TID). The MPIP PNG Project Runway was introduced in July 2015 to feature local designers, many of whom are women who work from their homes. There are cash prizes offered. Moreover at the Project Runway, local designers also have the chance to show their work to sponsors of the Miss PNG pageant where they can then gain paid work to make outfits for a sponsored contestant and then go on to dress her in the regional platform should their contestant win. The winner of Miss Papua New Guinea pageant has the enviable opportunity to wear the PNG designed outfits at events locally and regionally. “Dress for progress” is this year’ Project Runway theme and is taken from the International Women’s Day theme: “Press for progress”. Ticket price to attend the Project Runway is K250 per person, inclusive of complimentary drinks and finger food. The main sponsors are Pacific Balanced Fund (which has the Naming Rights), National Gaming Control Board (Official Sponsor), National Broadcasting Corporation (Official Broadcaster and Gold Sponsor), Paddy’s Hotel, Trends International, Colgate Palmolive, Brain Bell Group, Citi Boutique Hotel, Stanley Hotel & Suites to name a few. There will be raffle tickets on sale for K20 per ticket or K50 for three tickets. Prizes include an exquisite PNG silver Kundu and pearl choker donated by House of Gemini, a sewing machine, and an overlocker donated by Brian Bell. 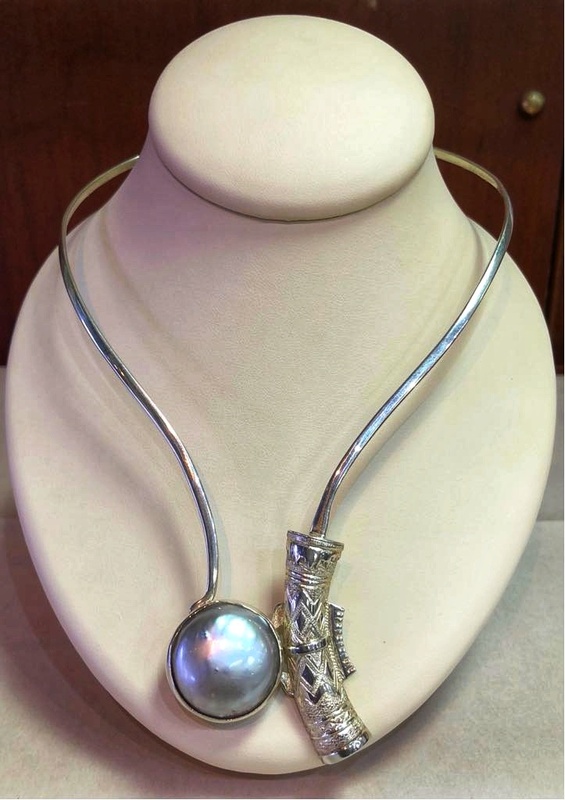 Kundu handcrafted from PNG Silver and Daru Pearl intertwine into an exquisite choker donated by House of Gemini jewelers. This is a raffle prize for the Project Runway. Tickets for this will be sold at K20 each or K50 for three tickets. All proceeds go to the MPIP PNG Scholarship Fund. The regional pageant was developed by the Government of Samoa to promote the numerous cultures of the Pacific Islands. The pageant offers young women from around the region an opportunity to act as “cultural ambassadors” for their countries. The pageant also aims to gain exposure for host nations, and bring publicity to the region and its many tourist attractions. The MPIP PNG Committee took on the pageant franchise eight years ago and manages it as a not-for-profit organisation. The pageant itself which prepares and mentors young women and selects a cultural ambassador to represent PNG. The MPIP PNG Scholarship Fund which raises funds to assist young women complete their tertiary education in colleges and universities in PNG. A Crowning Ball is held at the end of each year and the winner of this pageant represents PNG in the regional pageant held in a Pacific Island nation, this time in Tonga in December. MPIP PNG Committee Chairperson, Mrs O’Rourke said, “We aim to select a girl who is the embodiment of the modern Papua New Guinean women, both educated and culturally aware. "We also want to select a girl who represents the best that PNG has to offer, with the ability to share the spirit of PNG with others. “We believe strongly in education as a means to empower young women in PNG. With the Project Runway, we believe we are contributing to economic empowerment of our women. The Government, through the Asian Development Bank (ADB)- funded Civil Aviation Development Improvement Programme (CADIP)has invested over K111 million into Goroka Airport since 2009, according to National Airports Corporation board chairman Reuben Aila. Prime Minister Peter O'Neill opened the K95.7 million Goroka Airport upgrade project on Tuesday June 5. This together with other works since 2009 add up to more than K111 million. "Goroka Airport benefitted from the successful delivery of another two Cadip projects between 2010 and 2017, whose combined value was approximately K15.8 million," Aila said. "These two projects included the delivery of a state-of-the-art airport rescue and firefighting (Arff) from the United States to Goroka Airport under Cadip Tranche 2. "This also included a support vehicle, operational and maintenance training for the Arff and technical staff, and other ongoing support at a total cost of approximately K4.8 million. "The other project was the high-strength steel palisade security fence around the entire petimeter of the airport at a cost of approximately K11 million. "This investment has delivered world-class airport facilities that meet International Civil Aviation Organisation (ICAO) and Civil Aviation Safety Authority (CASA) PNG cenrtification requirements, and allow the unrestricted operations of F100 and other similar capacity aircraft at Goroka Airport." Installation of airfield lighting and precision approach path indicator (Papi) systems. 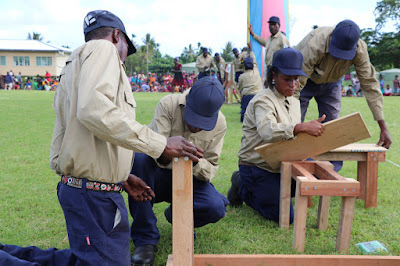 "The landside works included the construction of the new Goroka Airport Terminal building, construction of a new aircraft rescue and firefighting (Arff) station, a new powerhouse including the supply and installation of 2400kva generator sets, a new tractor shed with a tractor, slasher and trailer, and associated airport maintenance equipment," Aila said. "A new airport control tower will also be constructed as part of this project. "Construction will commence in June 2018 after Nac staff move into the new terminal building. "This will also enhance air navigational and management services, enhance communications navigation, and surveillance of air traffic management systems." Aila said the benefits of the Goroka Airport upgrade project included provision of safe, secure and reliable airport facilities to Eastern Highlands, the Highlands region and PNG as a whole. "The upgraded airport will facilitate social and economic development by enhancing agriculture, tourism and business connectivity," he said. PORT MORESBY, 22 JUNE 2018 - UNICEF is preparing to resume response and recovery support to earthquake affected communities in Hela after conflict and violence forced UNICEF, aid and relief workers, and other UN agencies to briefly relocate in April as a security precautionary measure. 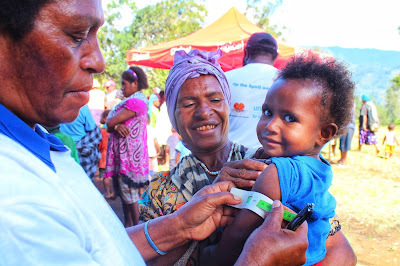 Aid nurse with UNICEF, Martina screens two-year-old Shenilda’s arm for malnutrition at Tate village, Southern Highlands. UNICEF is supporting a child health program that has screened more than 8000 children for severe acute malnutrition. 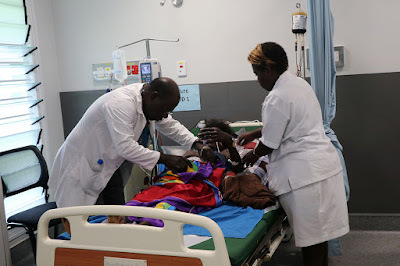 The programme is ongoing in two districts of Southern Highlands: Mendi-Munihu and Nipa-Kutubu, where 32 children have been identified and are being treated. Over 115,000 children under the age of 18 including some 32,000 under five years and close to 8,000 infants are expected to directly benefit from health, nutrition, education, child protection and water, sanitation and hygiene activities that UNICEF will support the Government to implement in Hela. At a partnership review meeting held on June 8 with local partners - Catholic Diocese of Mendi, Southern Highlands Provincial Health Authority, Caritas, Provincial Child and Family Welfare Services and the Provincial Education Department - UNICEF reiterated its commitment to fulfill its humanitarian obligations to the children of Hela and Southern Highlands provinces. 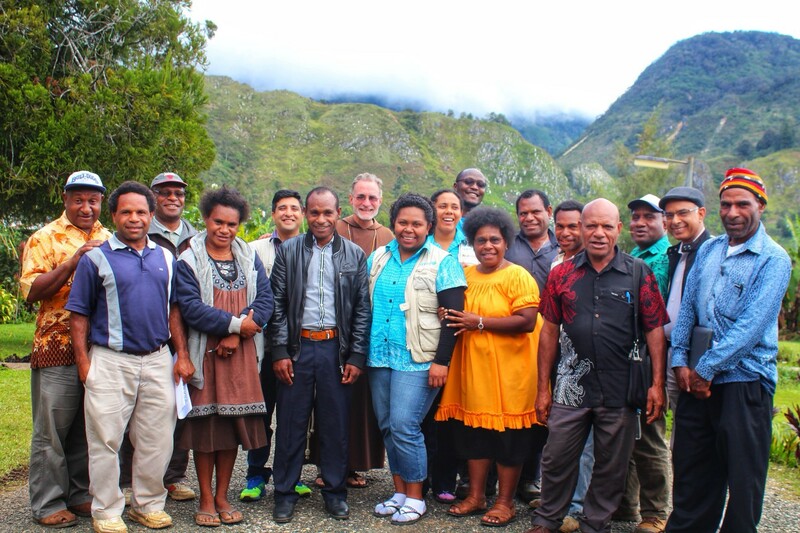 UNICEF and partners pose for a photo following the review meeting held at the Catholic Diocese of Mendi on Friday, June 8, 2018. 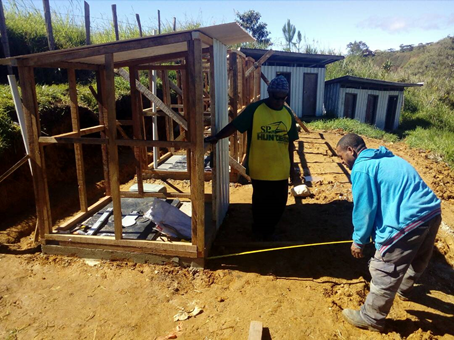 “We are happy to be able to go back to Hela where we will continue to work with the Government and our partners to provide much needed assistance to the children who desperately need help. "We have been working together since the earthquakes devastated communities and destroyed livelihoods and we intend to continue our support,” UNICEF Representative, David Mcloughlin said after the review meeting. Mcloughlin added that a two-month integrated child health campaign planned to kick off in mid-July will provide immunisation and nutrition services for.children while the establishment of Child Friendly Spaces will offer psychosocial support to children who have been traumatised by the earthquakes. “Children from badly damaged schools will be able to continue their education through Temporary Learning Spaces that we will support our partners to set up. construct Ventilated Improved Pits (VIP) latrines in these schools to promote good hygiene and sanitation practices,” Mcloughlin said. Aye Win (UNICEF WASH Specialist), Sam ­Walne (Catholic Diocese of Mendi programme manager) discussing pit latrine construction issues with John Wanpis, the teacher in charge at Kundaka Elementary School, during the inspection of the new latrines under construction. Kundaka is one of 10 schools in the province to have recently benefited from the partnership between UNICEF and the Catholic Diocese of Mendi. To date, UNICEF’s on-going response and recovery support in Southern Highlands and Hela provinces has seen more than 2000 children continue their education in 20 Temporary Learning Spaces with education supplies that UNICEF provided for teachers and students. Over 8000 children have been screened for Severe Acute Malnutrition, and more than 9000 children vaccinated while 12,000 children received deworming tablets. More than 3000 children now have access to safe water and proper toilets after UNICEF distributed water tanks to 10 schools and constructed VIP latrines for students. Many more children and women received psychosocial support and referral services under a Learning and Empowerment project that the UN in partnership with the Australian Government supports. UNICEF has been providing ongoing response and recovery support in Southern Highlands since March following February’s 7.5 magnitude earthquake and numerous aftershocks that hit four provinces and caused major devastation in Southern Highlands and Hela provinces killing more than 100 people and injuring many more. History was made in Goroka on Monday,June 4, 2018, as the first Air Niugini jet aircraft landed in Goroka after many years. 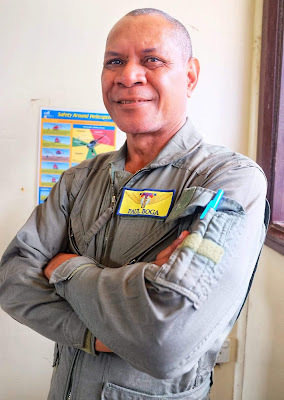 At just after 12.30pm, Air Niugini Flight P2-ANR, with Captain Francis Pohonhelan in the cockpit of the F70, flew down from the Bena mountains into the Goroka Valley to land on the brand-new runway. It was just a test flight, with no passengers on board, as hundreds of excited people lined the perimeter fencing of the airport to welcome back jet flights. Jet flights into Goroka stopped in 2005 due to the deteriorating condition of the runway. Since then, Goroka has only been taking in smaller Air Niugini and PNG Air aircraft, especially the Dash-8. A jubilant Pohonhelan, who used to fly F-28 jets into the town before, said after the history-making flight that resumption of jet flights augured well for the economy of Goroka and Eastern Highlands. National Airports Corporation programme-director for the Asian Development Bank-funded Civil Aviation Development Investment Programme (CADIP), Manua Kametan, was beaming as well. National Airports Corporation chairman Reuben Aila was an elated man as he watched the jet land. Prime Minister Peter O'Neill flew in the next day on an F70 jet and opened the Goroka Airport. Congratulating Captain Francis Pohonhelan on his history-making first jet flight to Goroka after many years. The legend Mal 'Kela' Smith, who has been flying in and out of Goroka since 1969, talks to me about what the new airport means to him. He remembers his old mate, Dennis Buchanan of Talair fame, pioneer Sir Danny Leahy, and the old-timers who built Goroka. Goroka MP Henry Ame says agriculture and tourism are set to boom in his town and Eastern Highlands following the opening of the new airport there. The airport was opened on Tuesday, June 5, by Prime Minister Peter O'Neill. 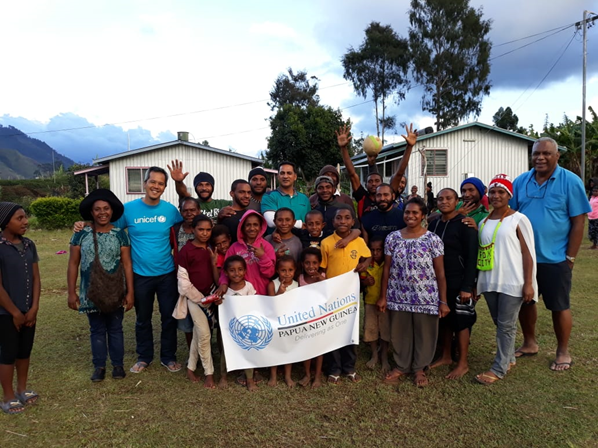 Port Moresby, June 21, 2018 – United Nations (UN) staff returned to Mendi in Southern Highlands province to resume humanitarian relief activities which have been ongoing since February’s M7.5 earthquake which took place in the Highlands of Papua New Guinea. The staff were warmly greeted with chants of ‘welkam back’ by communities including children, religious and local leaders. The UN relocated its personnel from Mendi following the outbreak of violence there on 14 June. 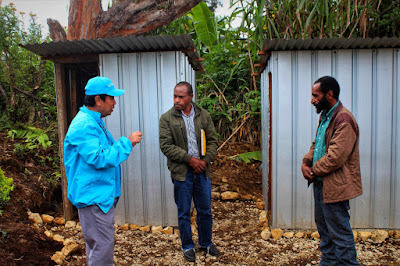 “We stopped at Ilo Elementary School, Yebi Primary School and Kalape Elementary School in Imbonggu District to see the progress on latrine and water storage installations, . . . .the three schools organised a celebration, welcoming (back) UN. "Chants, songs, posters – big and small, speeches, all thanking and welcoming UN. "Community leaders were there and also welcomed the UN team . . . saying people in Imbongu are peace loving.
" I was personally touched when the MC announced ‘mangi Mendi em kambek’” said Ali Ramly, UNICEF Team Leader. UN Resident Coordinator, Gianluca Rampolla said： “UN is committed to serve the people of Papua New Guinea and support the communities affected by earthquake in addressing their immediate needs. "Our immediate return is a testament to the commitment and dedication of our staff who are ready to work in the most difficult and challenging situations. "The welcome that the communities have extended to our staff is a very clear indication of the value of our work. The UN Resident Coordinator accompanied by the UNICEF Representative and a World Bank delegation will be travelling to Mendi over the weekend. Operating from its base in Mendi, the UN has been providing relief assistance to earthquake-impacted communities in Southern Highlands and Hela provinces. These include providing emergency shelters and households items while also supporting the rehabilitating of facilities in schools and health centres; establishing temporary learning space for children and empowerment spaces for women; undertaking province-wide immunization campaigns, malnutrition screening and treatment while providing access to psychosocial support, sexual and reproductive health and family planning services. The UN has also provided food assistance to remote communities in Southern Highlands, Hela and Western provinces experiencing severe food insecurity. The UN continues to support the PNG Government with humanitarian and logistics coordination for the earthquake response. The new Goroka Airport will bring in an increased number of tourists to Goroka and Eastern Highlands, says Tourism Promotion Authority chief executive officer and National Airports Corporation deputy-chairman Jerry Agus. He said this when commenting on the opening of the K110 million Goroka Airport upgrade project on Tuesday June 5 by Prime Minister Peter O’Neill (click to watch full interview). Agus said apart from the terminal, there were other things that made tourism click, if it was to grow in Eastern Highlands. Work on the much-mooted Nadzab Airport development in Morobe will begin in 2019 and be completed by 2022, says National Airports Corporation chief executive officer Richard Yopo. Funding agreements between Japan and Papua New Guinea were signed in 2015 but work has not yet begun on this project, which is planned to be developed as an alternative international airport to Jackson in Port Moresby at a cost of K692 million. Work was to have begun in 2017 and finished in 2020, but nothing has happened as yet. Japan International Cooperation Agency (Jica) and PNG Ambassador to Japan Gabriel Dusava in 2015 signed agreements for a K578 million loan to PNG for the Nadzab upgrade. The balance of K114 million will come from the PNG Government. Education is high on the priority list of new Western administrator Aquila Sampson. Sampson, in his first media interview on Tuesday June 19 as the administrator, said education remained a major obstacle to development in the country’s largest province. Aged 53, from Parama Island at the mouth of the Fly River, he was appointed administrator by Cabinet last Thursday. Sampson did his primary and high schooling in Lae before going to Sogeri National High School and University of PNG where he studied law. He is currently the acting-Commissioner of the National Lands Commission, and before that, was a deputy state-solicitor. Sampson, has also worked with national and supreme court judges and the Fly River (Western) provincial government. I appeal to our citizens in Angore , Hides and Komo areas to cease the use of threats, intimidation and guns as a means of getting your grievances heard and settled. I say this in light of the blockage and looting that took place on the fringes of Angore and Hides gas fields yesterday. I know the present issue they have is a K20 million claim for Angore township and another K12 million for their business development grant allocated in 2011, which is presently locked in court by the doing of one of their own tribesmen. Our people must restrain from threats and intimidation. If genuine issues remain outstanding, then civilised dialogue is the way to go for us now and into the future. Whilst there might be some elements of genuineness in those issues raised, the continuous use of unlawful means to secure attention is repulsive. This in the face of many issues our Government must handle not only for Hela and Southern Highlands, but the entire country. The O’Neill-Abel Government is not far from you landowners. In fact, on record we are the most-fulfilling Government in the history of our nation responding to the plight of many of our landowner issues. This not only in oil and gas areas but mining as well in terms of delivering to outstanding commitments. The O’Neill Government has signature policies like greater free carry equity empowerments. For Hela and Southern Highlands, our gas and oil fields have been producing since 1990. Yet,only after 2012 are we seeing serious signs of development happening or about to happen. Has Tari ever seen a sealed road? No,but it started to happen after 2012. From what I am told, the Halimbu-Nogoli Road sealing was to have seen its first laying of bitumen yesterday but the uprisings of Angore forced its closure again. This project was awarded in 2015, but lawlessness continues to hamper work. I appeal to our local leaders of youths, clans, and PDLs as well as leaders of facility site areas like Komo and the Pina plant site：Use myself and my two colleague MPs and our Governor to be your middlemen with National Government in a peaceful way to get your grievances out to National Government. If genuine legitimate commitments aren’t responded to, then I will be the first to support you tribesmen for court action as a final resort but not the use of violence and destructions. So far, I have received no invitation personally to hear your issues and relay to Government. How then can you say Government has not been responsive,hence your resort to lawlessness? I am again opening my office to our people in Hela to channel your issues through, instead of your continuous use of threats. One day soon your guns will be rendered useless. Mark my word as the hand of Government is much much longer then what many of you think. In July I will take officers from national departments through our project areas in Hela to hear you again. We will also tell you all how we are going in as far as getting your due benefits in royalties and equities. One-off payments like outstanding commitments will disappear. You only have to see how your cousins from PDL 1 and 7 have used up K20million and K15million respectively into thin air just this year. I ask you all to be fair to the Government, assist us get the clan-vetting complete and we start to get your entitlements out to you all. For your other issues, please channel through me and Governor Philip Undialu plus our two other colleagues in Minister Petrus Thomas and Vice -Minister Manase Makiba to pass on to Government. Our Government is in office, hence why are you evading us? I ask you all to remove blockages and we work through the normal channels of dialogue again. This Thursday my office will facilitate a meeting between all concerned leaders of project areas. I encourage you all to meet us to air issues of common concerns and we collectively map a way forward. Sometimes,answers may be right in front of us yet our differences of opinion, including politics, continue being blockages. Hela has many mountains of underdevelopment to climb. Hence we all cannot afford the luxury of differences to hinder us. There is no long-term winner in an environment of differences. 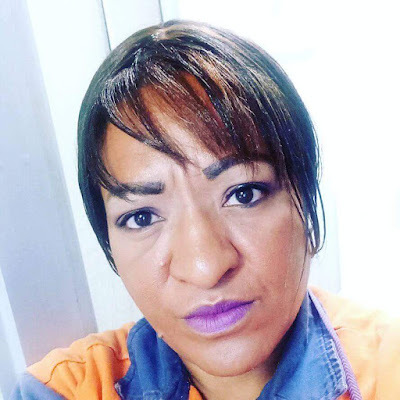 Lawyer Aquila Sampson has been appointed by Cabinet as Provincial Administrator of Western, putting to rest controversy over the position since the jailing of former provincial administrator Modowa Gumoi in Nov 2016. Sampson was chosen from a shortlist of three names submitted to Cabinet by the Western provincial executive council. As you would all have gathered, the Government has declared a State of Emergency in the troubled Southern Highlands Province. Chief Superintendent Paul Kamuai is appointed as Acting Commander New Guinea Islands. These changes will take effect immediately and will be in force until further notice. In the transition period I have appointed Assistant Commissioner Operations David Manning to take charge of all police operations in the Southern Highlands Province. He will be assisted by Assistant Commissioner Sylvester Kalaut, Acting Assistant Commissioner Crimes Hodges Ette and a team of detectives, and Acting Director Special Services Division Superintendent Julius Tasion. They will remain in the province until Assistant Commissioner Billie takes up his post. 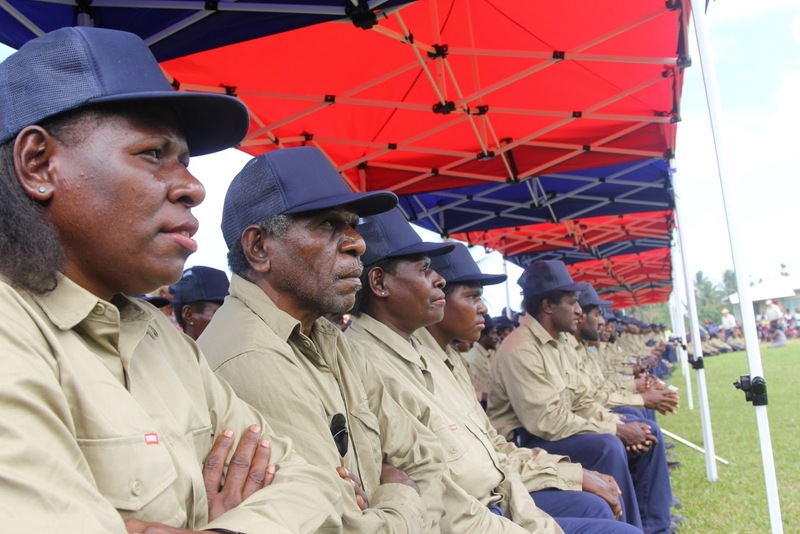 As we speak two police mobile squads totalling almost 70 police personnel are now in the Southern Highlands Province together with a contingent of Papua New Guinea Defence Force soldiers. Another two mobile squads are on standby to be sent to the Southern Highlands Province should the need arise. Investigations, arrest and prosecution of offenders. What occurred in Mendi including the burning of the National and District Court buildings, the Commerce and Industry building, the burning of the Air Niugini Dash 8 aircraft and the torching of Southern Highlands Governor William Powi’s residence are unthinkable acts of violence which need to be addressed immediately. Two warehouses in Mendi were also broken into during the riot and tonnes of relief supplies looted as well. This poses serious concerns about the welfare of people affected by the February earthquake. These acts of violence and criminal behaviour are clear evidence that there are underlying issues which must be addressed by everyone including the people themselves, and the various levels of leadership within the province. For the police we are treating these as criminal acts and will be taking appropriate and immediate action upon those who had participated in the destruction and burning of the buildings and the aeroplane as well as the looting of the relief supplies. I am appealing to the people of Southern Highlands and especially the leadership at the family, clan, tribal, village, electoral and provincial levels to cooperate with police and play their part in the restoration of peace and normalcy into the Southern Highlands Province, and more importantly in arresting those responsible for the destruction and looting. BEIJING, June 15 (Xinhua) -- Prime Minister of Papua New Guinea Peter O'Neill will pay a visit to China from June 20 to 26, as agreed by the two sides, Chinese Foreign Ministry spokesperson Geng Shuang announced Friday in Beijing. Prime Minister O'Neill's visit to China is an important high-level exchange between China and Papua New Guinea this year. During the visit, President Xi Jinping will meet with Prime Minister O'Neill. Premier Li Keqiang will also meet with him. The leaders of our two countries will exchange views on China-Papua New Guinea relations as well as other important issues of mutual interest. Besides Beijing, Prime Minister O'Neill will visit Shanghai, Zhejiang and Guangdong. Over the past 42 years since the establishment of diplomatic ties between China and Papua New Guinea, thanks to the concerted efforts of both sides, our bilateral relations have achieved remarkable progress. Notably, in November 2014, President Xi Jinping and Prime Minister O'Neill agreed to establish the strategic partnership featuring mutual respect and common development. Under the guidance of this important consensus, the China-Papua New Guinea relations have entered a new stage of rapid development. In November this year, President Xi Jinping will travel to Papua New Guinea for the APEC Economic Leaders' Meeting, which will provide an important opportunity for the further development of China-Papua New Guinea ties. China is willing to work with Papua New Guinea to maintain the momentum of high-level exchanges and interactions at other levels, deepen mutually beneficial cooperation in all dimensions, and enhance communication and coordination in international and regional affairs so as to move forward the China-Papua New Guinea strategic partnership. Prime Minister Peter O’Neill has announced that the National Executive Council has approved the declaration of a state of emergency for the Southern Highlands Province, and a call-out of the Defence Force in the province. in the Southern Highlands, ensure all Leaders with potential involvement in unlawful behavior are held to account, and prevent further unlawful activities. 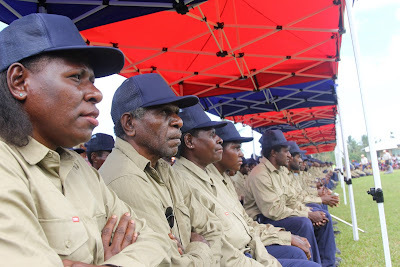 “The state of emergency in Southern Highlands Province will be in place for a period of nine months, and Mr Thomas Eluh is being appointed as the controller of the SOE. “Put simply, I have had enough of this nonsense that has been manipulated by people who would call themselves leaders. “Police will investigate every agitator, and every person who was involved in the unrest we saw yesterday. “No person is above the law and all involved will face the full force of the law and answer for any crime they have committed. “The Southern Highlands Province has so much going for it, so many natural resources and agricultural potential. “We will not let this potential be undermined by people who have failed in politics and want to cause disruption. “The Southern Highlands Provincial Government has been suspended, and I will oversee the operations of the Southern Highlands Provincial Government on behalf of the National Executive Council. “It is important that we place the actions we saw yesterday into context. “The ridiculous behavior by an unruly group is all about local level politics and attempts by failed politicians to vent their anger over their inability to be duly elected. immediate effect for the duration of the state of smergency. (CID) to the Southern Highlands Province with immediate effect. Southern Highlands Provincial Government on behalf of the NEC. accordance with Section 187E(6) of the Constitution. consultation with the acting provincial administrator and the controller. - Approval of K6 million in funding to enable the SOE mobilisation immediately. implement the decision of the National Executive Council. As an aviator and a former soldier, I am totally disgusted but also sorry for our nation. There is NO national pride and patriotism shown by people who call themselves Papua New Guineans. Aeroplanes have built this nation and stand to be our flag carrier around the world. Before we point fingers, we must remember that every problem has a root cause. After 42 years of Independence, the educated know that our Constitution is nothing but a joke. Laws are too weak to deal with crime and our natural resources are used against us to kill ourselves. Well， we need to open our eyes now. I am so ashamed to be a Southern Highlander right now. Riots over court decision related to "rigged election" allegations result in the burning down of a plane belonging to our flag carrier. Why are we as a province allowing people from two or three districts to engage in acts of terrorism and tar us all with the same paintbrush? Why are we acting like Peter O'Neil/Michael Nali/William Powi etc own Air Niugini so we burn it down? Why are other districts looking at this like a Mendi/Nipa problem and distancing ourselves? Why do supporters feel the need to burn our historical buildings because their candidate did not make it? Are these the kind of leaders we want representing us? Yumi tok Souths Pawa na where stap pawa blo yumi? We have just declared war on Papua New Guinea by burning the one thing that unites us PNG people. We need to think hard about our destiny as a people and make some hard decisions. Time blo sackcloth and ashes lo mekim traipla repent because we are no longer Souths Pawa. Air Niugini has been in existence for 45 years serving this country with pride. It has always been for me a symbol of unity, a unifying factor in bringing our country together for the past 45 years. For a country with very limited road infrastructure, it was the airline that brought our people together. From East to West or North to South, it was PX that brought us together. When you traveling in from overseas and you board an Air Niugini aircraft in one of our overseas destinations, you get a sense of pride as you see the bird of paradise on the tail of the aircraft and you know you are home. For over 2000 staff who work day and night to ensure our airline flies and continue to serve our people every day, despite criticism at times and the fact that many routes are non-profitable but we have to continue to operate as part of our obligation to our country, today is indeed a very sad day in the history of our airline and country. I am saddened to see the picture below and it breaks my heart. For me after serving our airline for 36 years, I am in tears. I am sure many of our staff who are so committed to this airline and our country are asking themselves WHY? After the incident of today, our first priority was to get our dedicated crew out of harms way. Am pleased that no passenger was harmed but the aircraft, WHY? This post is my personal reflection of today’s event and is not necessarily of the airline acknowledging I hold a senior post in the airline. 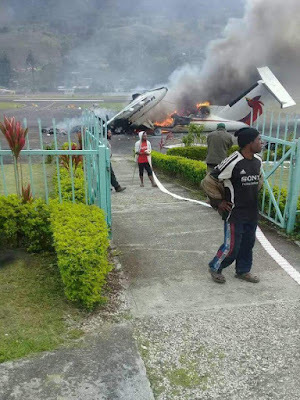 A Link PNG DHC -8 aircraft was damaged during civil unrest at Mendi airport, Southern Highlands Province this afternoon following an election petition decision. "The actions we have seen today in Mendi are an absolute disgrace. "A State of Emergency will be declared, and additional security forces being deployed to prevent further unlawful behaviour. "An emergency meeting of the National Security Council will take place tomorrow at 9am to approve emergency arrangements under appropriate laws. "Those involved will be detained by police and prosecuted. "There is no place in in politics for this type of behaviour, and leaders involved with this activity will be held to account. "All leaders must respect the rule of law, respect decisions of the court and respect the safety of people and property." 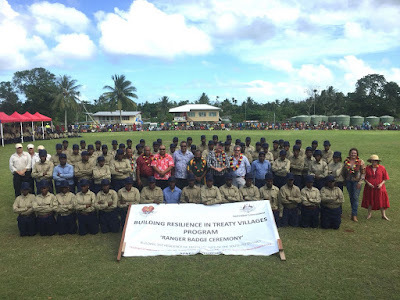 Twenty-two women are among 59 community rangers from the South Fly District of Western Province who graduated this week through the Building Resilience in Treaty Villages (BRTV) project. The dignitaries with the rangers following the graduation. Managed by the Cairns-based Reef and Rainforest Research Centre, the BRTV project aims to build the resilience of the South Fly’s 13 coastal villages by training community rangers in food security, construction, sanitation, first aid and leadership. Dobrag Done (right) from Sigabaduru village graduated from Phase 1 of the project while Cece Wainetti from Tais village was among the recent cohort. The graduation ceremony was held on Daru Island on 11 June and attended by the Western Governor Taboi Awi Yoto and Gulf Governor Chris Haiveta, Minister for Defence Solan Mirisim, Minister for Police Jelta Wong, Minister for Immigration and Border Security Petrus Thomas, the Australian Member for Leichhardt, Warren Entsch, Australian Shadow Minister for International Development and the Pacific, Claire Moore and Australian High Commissioner, Bruce Davis. Monica from Mari Village (left) is one of the 22 women who graduated as a community ranger. 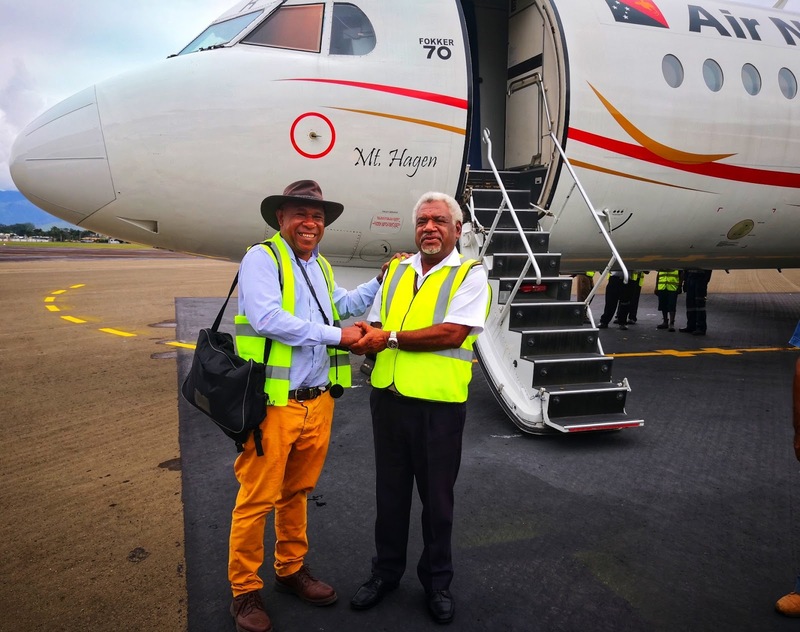 “Papua New Guinea’s South Fly District and northern Australia share a long history of social, cultural and economic connections, formalised through the Torres Strait Treaty which came into effect in 1985,” said Mr Davis. 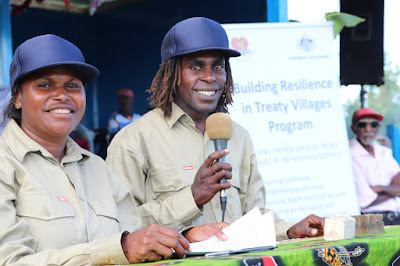 “It is through these ties that we are supporting a community ranger model for the 13 Treaty Villages in this remote area, which is based on an Indigenous Australian model operating in the Torres Strait Islands. The rangers demonstrate how to attend to a snake bite victim, a common issue for villages along the South Fly. Mr Davis added that there is no separation of roles for male and female rangers, regardless of traditional cultural norms. Female rangers are treated equally throughout the training and learn the same skills as men, such as small boat handling, safety and maintenance. The rangers demonstrate their carpentry skills in building school furniture. The BRTV program is supported by the Papua New Guinea- Australia Partnership.